Do you need a basic online “Coming Soon” page for your business or organization? Over the years, many clients have contacted Studio 544 to set up a “Coming Soon” or temporary online landing page for their new web sites until they are ready to move onto the next step of launching their regular website. Typically this “temporary” landing page will consist of their company logo, contact information and possibly even a signup form. It’s very basic but it allows them to lock in their domain name and at least be able to direct people to the site for their contact information. 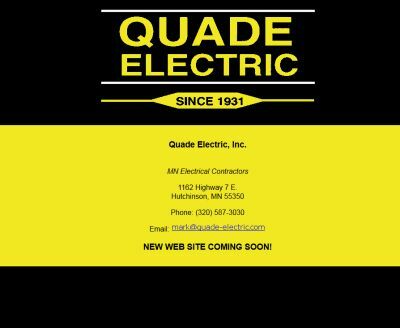 Click on the image of Quade Electric below to see an example of a temporary landing page set up by Studio 544. Think of a temporary landing page as a placeholder for your new web site. Not only does a temporary landing page give your business a basic online presence but it allows you to do so at a fraction of the cost of a full web site. Many businesses find this useful when budgeting for their website by breaking up the process into stages so they can set aside a small amount of money to get up and running with the temporary landing page until they have had time to figure out what they want to do with their regular website. It also allows them more time to accumulate content, images, etc. to include on the full web site. 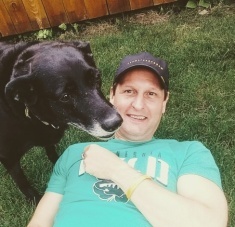 Contact Mark Lewandowski at Studio 544 in Hutchinson, MN today to find out how easy it can be to get a temporary landing page or coming soon page set up for your business or organization. ← Looking for a responsive web site?